Paper Made Bakery: Make it happen! Julie with you here today sharing a card I made with the amazing March kit -- Signs & Symbols!! such a bright happy card, i love it!! Love that Washi tape. My local stores don't carry that design--or anything like it! What a lovely card! 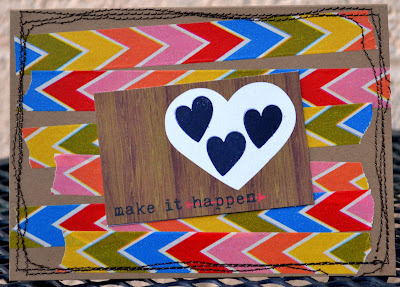 Love the combo of chevron and woodgrain and LOVE the fun background made from washi! Totally adorable project, Julie! I love the glitz washi tape. I've never seen washi tape like that before. Your card is so fun Julie! love the bright colors and the tape!!! darling design!!! Very fun and so colorful! Awesome job Julie! LOVE how you used the kit to make this yummy card, Julie!! So cool - glitz washi tape. Love what you created!! Very cute and inspiring Julie! This is an absolute creative tips. Looking at it make my thoughts spin. Hmmm... might be a name tag on table, Thank you cards or maybe invitation cards? Cute Julie! Love the Glitz Washi Tape with the Wood Grain! Such a cute card.. So clever how you used that washi tape. Such a happy card Julie!! Ooooh that washi is dabomb!! Love how you used the washi...so fun! Love this! So colorful! Great way to use the tape! Looks fab!